Tigers Academy made it three wins from three games in the Under-18 League season with a 34-7 victory over Wasps at Oval Park on Saturday afternoon. Tigers opened the scoring when scrum-half Sam Edwards received an offload from wing Joe Browning after a good run down the left to dot down the try. Wasps were quick to respond and built phases in Tigers 22 from the restart for Tom Bacon to score and it took a penalty from Harry Glynn to give Tigers the lead against at 10-7 a few minutes later. Sam Costelow was next on the scoresheet as Wasps worked to get out their own 22 and Glynn intercepted before providing a quick offload to set Costelow away and under the posts. Glynn added the conversion and another penalty to stretch the lead to 10 points at 17-7 with just 20 minutes gone in the game. There was another try before the break from Ronnie Du Randt as Tigers built through the phases and the centre found a gap to score and make it 22-7 at half-time. Browning claimed the opening points of the second period as he showed his speed and quick feet to step defenders on a run down the wing to score in the corner. It was the opposite wing, Leo Gilliland, who rounded off the tryscoring as Tigers worked the ball through hands from a scrum to go wide and, with Costelow adding the conversion, the lead reached 34-7. Highlights of the match can be found on LTTV by clicking here. The Tigers Academy are back in action this Saturday against Sale Sharks at Oval Park. Kick-off is at noon and supporters are welcome. 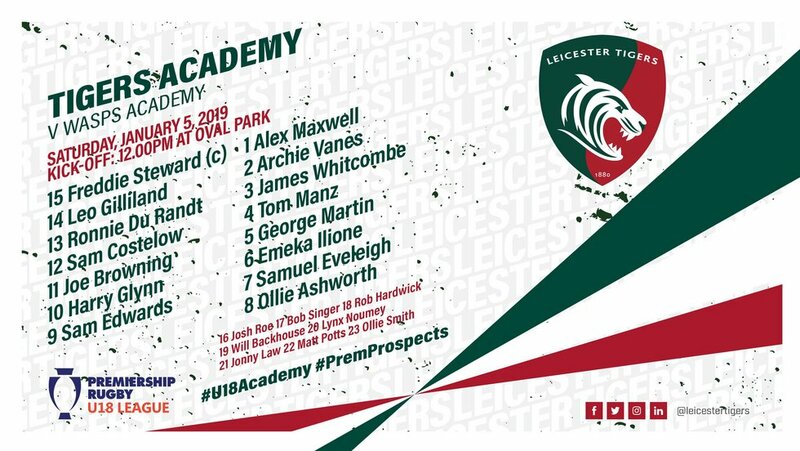 George Martin and Freddie Steward have been named in the starting side for this Saturday's U18 Academy League fixture against Wasps at Oval Park after the pair featured off the bench in Monday's Premiership Rugby Shield game at Loughborough University. Steward will also captain the side for the first time this season. The pair were second half replacements in the New Year's Eve clash with Newcastle, with Jonny Law starting the game at scrum-half and set to feature again this Saturday after being named on the bench. Alex Maxwell, Archie Vanes and James Whitcombe will start their third successive League game in the front-row, with Tom Manz joining Martin in the second row to make up the front-five. Sam Edwards starts his first game of the 2018/19 season at scrum-half with Harry Glynn and Sam Costelow in a straight swap between fly-half and inside centre from the Academy's last outing against Northampton Saints. Saturday's game will be the first home game of the season for Leicester's Academy squad after registering two wins from the opening two fixtures, away from home, against Newcastle in Round 1 and Saints in Round 2.